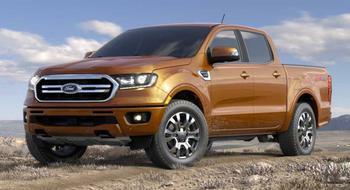 Ford Motor Company is recalling 2,992 model year 2019 Rangers equipped with 10-speed automatic transmissions. The transmission shift lever in some vehicles can be moved from the "Park" position without the key in the starting system and without depressing the brake pedal. If the vehicle can be shifted out of Park without the brake applied, the vehicle may move unexpectedly, increasing the risk of injury or crash. Ford has notified owners, and dealers will inspect and repair the transmission floor shift selector interlock assembly, as necessary, free of charge. The recall began February 22, 2019. Owners may contact Ford customer service at 1-866-436-7332. Ford's number for this recall is 19C02.